Quick rant I need to get out there. Yesterday, Josh and I attended Opening Day at Nationals Park with some friends. The game was rather uneventful as Atlanta beat the home team 2-0 on a bitterly cold "Spring" day in DC. Unfortunately it wasn't just the Nationals hitters that didn't perform well, from my experience the entire food services staff at Nats Park seemed to be sleepwalking through a Spring Training game. Since Nats Park opened a few years ago, the customer service I have experienced at the park has been outstanding. Plenty of food options, reasonable line lengths and great food quality. Yesterday it seemed that all the progress of the past few seasons was thrown out the window. Most of the main concession spots near our seats in right-centerfield were boarded up with a "coming soon" message in place. This forced us to go to the Deli stand a few sections over. My brother and sister-in-law had already told us the signature item at the deli (a sectioned piece of garlic bread type substance) was sold without any dipping sauce. Apparently they didn't have anything to dip it in even though the signage at the concession stand clearly stated the lure of "ripping and dipping" the bread. The staff seemed to not care that they didn't have the sauces and operated the stand in total slow-mo. We got to the front of the line and waited for literally 5-10 minutes while the woman behind the counter slowly counted the register money and goofed around with her co-workers. When done she said coldly "Whatdoyou want!" I almost left right there but we were hungry and ordered a few items. About 5 minutes later we got our food. An uninspired slightly cold Reuben sandwich, a small grilled cheese, chips, a water and Cracker Jack for $25 altogether. Not exactly the food I've come to enjoy at Nats Park (Five Guys, Hard Times, etc..). Later in the game, hoping to find better options we went down to the ground floor of the stadium. We stood in line for hot chocolate only to have the staff tell us when we go to the front "we don't have any left". We then went to the Funnel Cake line to try to get some warm food. Again we sat in a 4-5 person line for at least 5 minutes. Getting to the front, the cashier seemed like he had never seen a $20 bill before and took forever making change before finally telling us to step over to retrieve the cake. I found the whole experience to be more fitting of a Minor League Class A stadium. It seemed as if no training or preparation was made at all. Not once through all of the line and supply disasters were we told that the Nationals staff was sorry for the inconvenience. Just an overall rude and cold experience that matched the weather of the day. I'm getting used to the Caps and Wizards experience where you can voice your frustrations easily to the owner (Ted Leonsis). I'm hoping the Lerners will offer that same sort of access to fans and I really hope that the Opening Day service was an anomaly and not a trend. You get much better service at minor league parks. 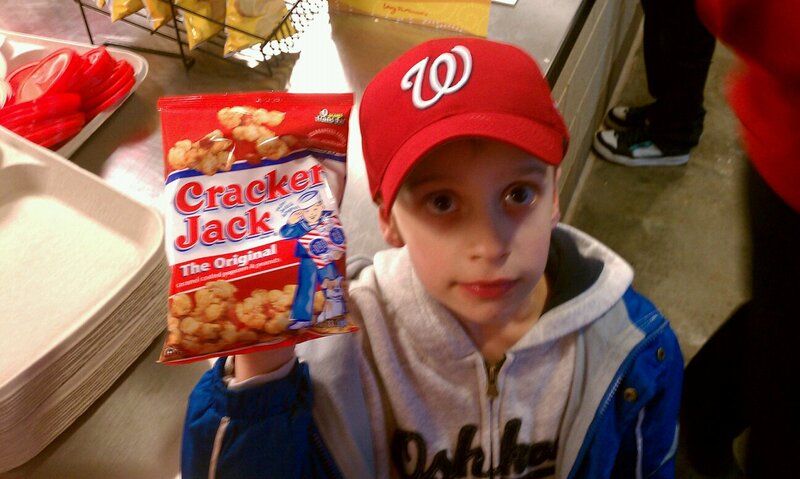 This is the second out of three opening days at Nats Park where they've dropped the ball. Some polite bitching may be in order. I would argue that the service is this bad most of the time. That stadium needs to put a good product out, cause the team isn't doing that.